These maps are designed to give the general public as well as land-use planners, utilities and lifeline owners, and emergency response officials, new and better tools to assess their risk from earthquake damage. The maps also contribute to the California Geological Survey’s Seismic Hazard Zone maps. The first is a new map of the young geologic deposits in the low-lying sections of the Bay Area. Most residents of the Bay Area live and work in these low-lying areas that are underlain by these young deposits. It is important to map these deposits because so much of our infrastructure resides on them, and because they may host liquefaction, the phenomenon of saturated soils losing their stiffness and strength during shaking. Some of the young deposits strongly affect the strength of earthquake shaking that is transmitted through the deposits. Figure on left shows that the shaking experienced in a region depends very strongly on the type of deposits found near the surface. Soft muds shake much harder than bedrock. Figure on the right (USGS photo) shows part of the Cypress structure, the freeway approach to the Bay Bridge from Oakland, which collapsed during the Loma Prieta earthquake, killing 42 people. Soft muds on which it was constructed shook much more strongly than surrounding regions on stronger ground. Detailed mapping is needed to forecast where shaking will be strongest during future earthquakes. The second of the maps shows the likelihood that these young deposits will liquefy, or turn into a sandy liquid due to the strong shaking a big earthquake will produce. When the ground liquefies, it may lose its ability to support buildings and other structures. Liquefaction during large earthquakes commonly disrupts pipelines and road networks and also may cause buildings to settle and move downslope or toward stream banks. Regions of man-made landfill fared poorly in the 1906 San Francisco earthquake throughout the Bay Area. Photos above show two low lying areas in San Francisco where damage from the 1906 earthquake was associated with liquefaction and ground failure. Photo on left shows Dore Street (Bancroft Library) and Howard & 17th Streets (G.K. Gilbert, USGS photo). Many regions of man-made landfill liquefied in the 1989 Loma Prieta earthquake. The Marina district, a shallow bay filled in after the 1906 earthquake, suffered some of the worst damage in the 1989 earthquake (USGS photo). These new maps cover the San Francisco Bay region (outlined in red). A previous USGS map, published in 2000, covers a larger region (outlined in black). Northern San Francisco and the Marin peninsula are not included in the new maps because geologic field mapping in these regions is incomplete. Please use the older map for areas not covered by the new map. The older map also shows locations of liquefaction observed in historical earthquakes, particularly the Great 1906 earthquake and the 1989 Loma Prieta quake. In addition, the California Geological Survey has zoned the greater San Francisco area for liquefaction hazard in their seismic hazard maps. 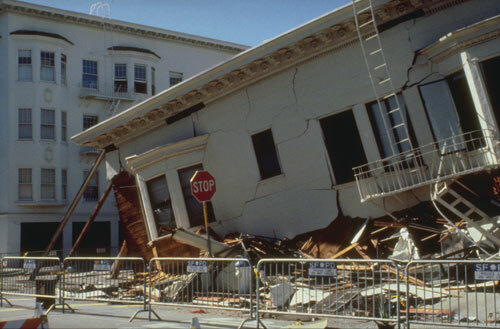 We can expect history to repeat itself in the next big Bay Area earthquake. The highest hazard areas shown by the liquefaction hazard maps are concentrated in regions of man-made landfill, especially fill that was placed many decades ago in areas that were once submerged bay floor. Such areas along the Bay margins are found in San Francisco, Oakland and Alameda Island, as well as other places around San Francisco Bay. Other potentially hazardous areas include those along some of the larger streams, which produce the loose young soils that are particularly susceptible to liquefaction. These new maps show a lower likelihood of liquefaction than previously thought in regions underlain by Bay mud that fringes many parts of San Francisco Bay. Bay mud remains a seismic hazard because on the basis of its past performance in earthquakes it will produce stronger levels of shaking than other geologic units. The new maps show in unprecedented detail the nature of the materials that underlie areas of densest urban development and highlight areas that may be prone to shaking-related damage during future earthquakes. These maps are the result of over a decade of work and collaboration between geologists from the consulting firm William Lettis & Associates, the U.S. Geological Survey, and the California Geological Survey. Many of the region’s utilities and lifeline owners have made use of an earlier version of these maps in vulnerability assessments of their systems.